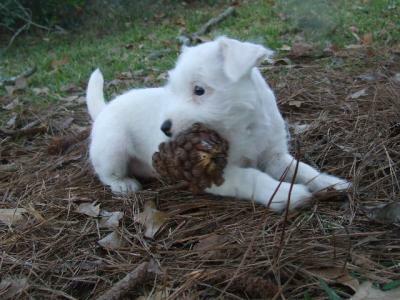 Emmy Lou and her 'prize pinecone! Tally Hills Terriers is not a kennel at all...all of our Jack Russells live in the house. What you say, 9 Jack Russells together? Yes, it can be done!! You see, not all Jack Russells are hyper, crazy little terrors. On the contrary, of course any terrier was initially bred to be a hunting dog, so all are or should be prey focused. And that includes, squirrels, birds, cats and even socks! Every dog should have a "job" to do, or a way to get out excess energy. A Jack Russell, while very cute needs to have walks, or exercise in a fenced in yard. And I believe that every dog needs their humans to love and spend time with them. We are affiliated with the JRTCA, the largest single breed national club for Jack Russells. There are many state affiliate clubs holding dog trials that include terrier racing, conformation, GTG(which involves a tunnel and a caged rat) to show their hunting instinct. As well as agility, barn hunt and lure coursing. What versatile dogs these are...they love to compete with their humans, in many other sports as well as including fly ball, obedience, and rally-O. A Jack Russell will bond deeply with you, all they ask in return is a little of your time and love. All of our terriers are BAER tested(determines that they have no hearing deficit), and breeding dogs are CERF tested(which ensures that yearly they are free of cataracts. Our puppies are lovingly whelped and raised in our home, extensively socialized and temperament tested which helps to ensure that the right person gets the right puppy. We only breed 1-2 litters/yr, so if you are interested, take a look @ our website, Tally Hills Terriers. I enjoy talking about Jack Russells, their needs and take pride in breeding a limited number of quality terriers. But be warned....Jack Russells weave their way into your heart, they are highly intelligent and very loving.